Multicomponent viruses, which separately package different genome segments, were thought to be restricted to plant and fungal hosts. Ladner et al. characterize a multicomponent mosquito virus and describe an evolutionarily-related, segmented virus in a non-human primate. These findings provide evidence for multicomponent animal viruses and suggest relevance to animal health. Photo depicts the presence of different viral RNA segments within infected cells. 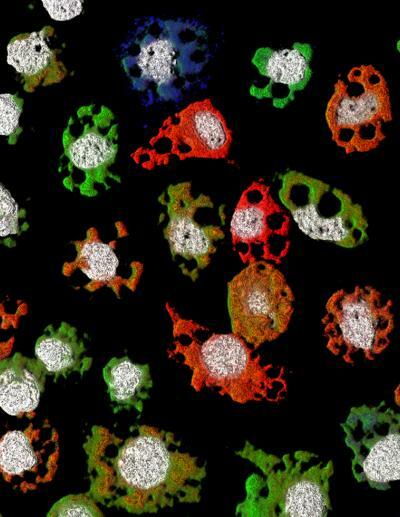 Scientists have identified a new “multicomponent” virus — one containing different segments of genetic material in separate particles — that can infect animals, according to research published today in the journal Cell Host & Microbe. This new pathogen, called Guaico Culex virus (GCXV), was isolated from several species of mosquitoes in Central and South America. GCXV does not appear to infect mammals, according to first author Jason Ladner, Ph.D., of the U.S. Army Medical Research Institute of Infectious Diseases (USAMRIID). However, the team also isolated a related virus — called Jingmen tick virus, or JMTV — from a nonhuman primate. Further analysis demonstrates that both GCXV and JMTV belong to a highly diverse and newly discovered group of viruses called the Jingmenvirus group. Taken together, the research suggests that the host range of this virus group is quite diverse–and highlights the potential relevance of these viruses to animal and human health. Several plant pathogens have this type of organization, but the study published today is the first to describe a multicomponent virus that infects animals. Working with collaborators including the University of Texas Medical Branch and the New York State Department of Health, the USAMRIID team extracted and sequenced virus from mosquitoes collected around the world. The newly discovered virus is named for the Guaico region of Trinidad, where the mosquitoes that contained it were first found. In collaboration with a group at the University of Wisconsin-Madison, the USAMRIID investigators also found the first evidence of a Jingmenvirus in the blood of a nonhuman primate, in this case a red colobus monkey living in Kibale National Park, Uganda. The animal showed no signs of disease when the sample was taken, so it is not known whether the virus had a pathogenic effect. Jingmenviruses were first described in 2014 and are related to flaviviruses — a large family of viruses that includes human pathogens such as yellow fever, West Nile and Japanese encephalitis viruses. While it is difficult to predict, experts believe that the infectious viruses most likely to emerge next in humans are those already affecting other mammals, particularly nonhuman primates. This research was supported by the Defense Threat Reduction Agency, the National Institutes of Health, the James W. McLaughlin endowment fund, a Smithsonian Tropical Research Institute-Environmental Protection Agency grant, and a Robert E. Shope fellowship.